We present a new high-technology product for protection of your PC from all kinds of malware such as viruses, trojans, worms and other dangerous programs. NANO AntiVirus was developed to provide the security levels that conform to actual threats. In addition we took into account the important requirements for an antiviral program from end users. 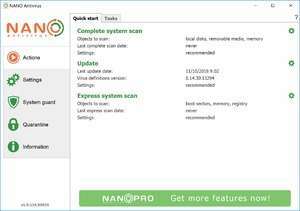 For security reasons, you should also check out the NANO Antivirus download at LO4D.com which includes virus and malware tests. Additional screenshots of this application download may be available, too.